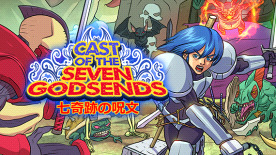 Cast of the Seven Godsends is developed by Raven Travel Studios, production support from IV Productions and published by Merge Games Ltd. © 2015. Merge Games Ltd. is a registered trademark of Merge Games Ltd. Cast of the Seven Godsends and Raven Travel Studios are trademarks or registered trademarks of Raven Travel Studios. All other trademarks, copyrights and logos are property of their respective owners.